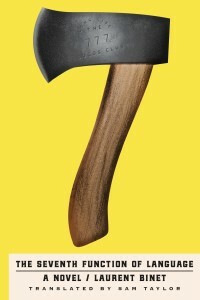 Channeling Thomas Pynchon at his most madcap and boasting an expert’s knowledge of literary theory, Laurent Binet’s The Seventh Function of Language is semiotics fanfiction. In 1980, when Roland Barthes is mowed down in the street by a laundry car, a police constable and his bumbling professor sidekick are on the case in search of motive and meaning. Officer Bayard and Professor Simon Herzog discover that Barthes was carrying a document that didn’t make it to the hospital: someone, perhaps the man who claimed he was a doctor at the scene of the accident, rifled through his coat. Whatever this piece of paper had on it seemed important enough to drive a person to murder, and it is up to these two unlikely protagonists to figure out the mystery. Roland Barthes, Michel Foucault, Gilles Deleuze, Umberto Eco (to name a few) – readers will recall the novel’s entire cast of characters from past college lectures. But that shouldn’t turn anyone away: Binet’s story is different than the dry academic settings that these theorists may have first appeared in a person’s life. His investigators journey through a network of Bulgarian spies, gay discotheques, and underground fight clubs where men and women spar with dialectic instead of fists. 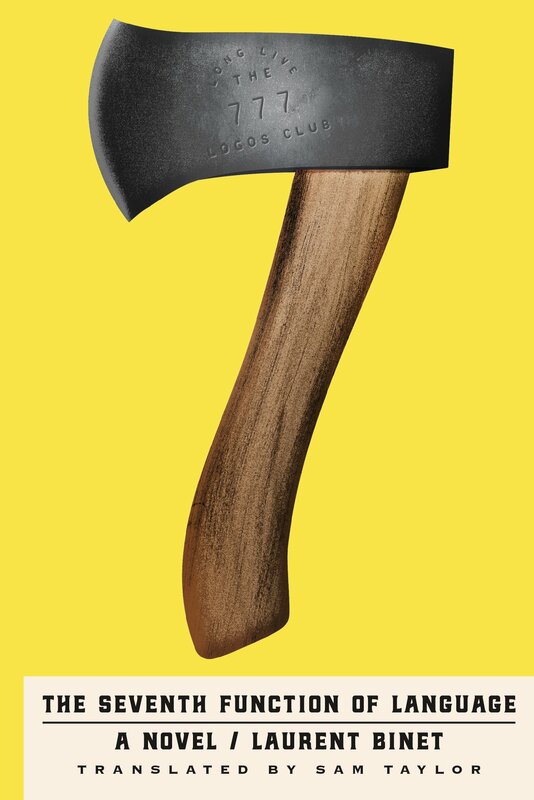 It’s uproariously witty and shockingly readable: despite the thick undercurrent of theory and rhetoric in The Seventh Function of Language, the book is hilariously full of action, with scenes of exploding train stations, poisoned umbrellas and severed fingers. “Roland’s great semiological lesson,” Umberto Eco explains in the novel, “is pointing to any event in the universe and explaining that it signifies something.” Challenge accepted, Binet seems to reply. By choosing a policeman protagonist who doesn’t care to comprehend semiotics, Binet renders his book slyly accessible to the layman. Simon repeatedly gives him tips into this study of language and all the substrata of meaning underneath a person’s words. Readers who aren’t academicians will find these asides surprisingly understandable, and will smile every time Bayard doesn’t get what Simon’s trying to say. The Seventh Function of Language may sound dense and unbreakably smart but it’s not; Binet repeatedly punches holes through his own erudition and allows eager readers to discover semiotics on a self-effacing level that’s at once masterful and silly. When Bayard finds a primer on Roland Barthes, he “knows that this kind of book is not aimed at him, that it’s a book for intellectuals, for those smart-assed parasites to have a good snigger among themselves.” Binet’s prose is so self-aware it is difficult not to laugh with him. Roman Jakobson is introduced at a turning point in the novel and Binet carefully outlines his theory of the six functions of language. These are, at their core, the six different ways to convey words and meaning: the referential (speaking about something), the emotive (judgements, irony), the “conative” (ie, the imperative, when a person addresses someone else), and so on, with increasing complexity. Amidst all the intrigue that swirls around Barthes’ death, it becomes apparent that some scholars believe there to be a seventh function of language: the performative, or incantative. As in, the type of language that would make something happen. Words that result in action. “Let there be light. And there was light,” Binet writes, citing the oldest known instance of the performative function. Meanwhile, Giscard and Mitterand are debating for the 1981 French presidency, and members of the Logos Club are battling wits in undisclosed locations alongside filmmaker Michelangelo Antonioni and Umberto Eco, all with their eyes set on dethroning the top ranked Great Protagoras. In England, Wimbledon is coming down to the semifinals and at Cornell University a greatest-hits roster of theorists are descending for a conference. Wouldn’t a power like the mythical seventh function guarantee a winner in any of these contests? The Seventh Function of Language is an accessibly academic joy to read. Binet clearly has a masterful control of his subject, so much that he’s able to bend these otherwise difficult ideas into something that resembles a police thriller and still convey the same complex theses. It’s a drunken thunderclap of alternate history built from an unmistakable fluency and genius wit.